When it comes to fried chicken, texture is key. The crispy crunch of that deep fried golden brown skin is an absolute must. Without it, it might as well be a rotisserie. The crispier the fried skin, the better, right? Who’s with me? I can see you nodding your head in approval. 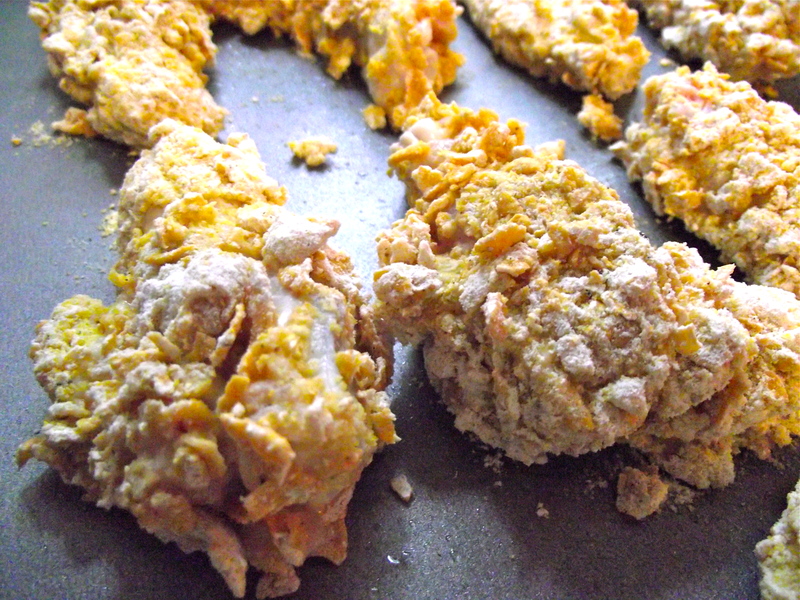 More than once I’ve tried to re-create the crunchy goodness of a fried chicken in the oven but nothing really came close to achieving the same crunch effect I was after. I’ve tried shake n’ bake, Kraft’s oven fry, and even panko breadcrumbs (which really felt like eating chicken tempura as opposed to shrimp) to no avail. Seasonings and flavor were intact yet I wasn’t getting the texture I craved…until of course I came across this recipe. Who knew the answer would be as simple as cornflakes?! I’ve heard of people coating all kinds of goodies with cereal before so why not chicken? It’s probably the closest I’ve come to achieving the same crunch as fried and so I’m dying to share it with you because I absolutely love this recipe. Step 1: Take the chicken wings and separate the joints. Trim off extra fat and cut off the tips. Give the wings a quick rinse under cold water and set aside. Step 2: Make the marinade. In a bowl, mix together the buttermilk, hot sauce, salt, black pepper, onion powder, and garlic powder until equally mixed. Yummm. Buttermilk is key! Step 3: In a large resealable bag, add the chicken wings then add the marinade, coating the wings evenly. Squeeze out as much air as you can out of the bag then seal. Pop it in the fridge and let the wings marinate for 24 hours. The longer they swim in the sauce, the better, the slurpier! Step 4: Combine the crushed cornflakes, flour, cornmeal, and salt and pepper to taste in a tupperware. Seal and leave at room temperature. Step 8: While the chicken is getting crispy and juicy in the oven, make the sauce. In a saucepan over medium heat, mix together the honey, and red pepper flakes. Add more or less flakes if you desire. Continue mixing until the honey thins. Reduce heat to low and keep warm until wings are cooked. Step 9: When wings are cooked, place them in a large mixing bowl and drizzle the honey pepper sauce on top. 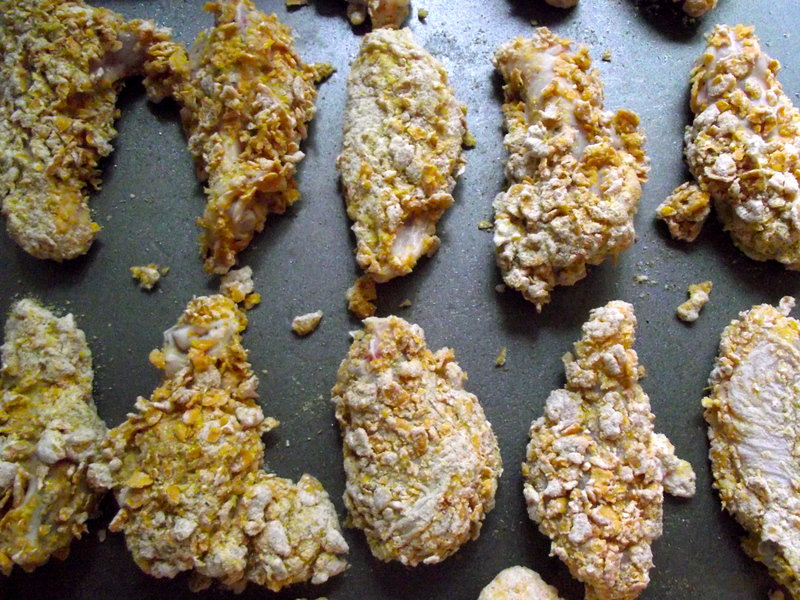 Very gently, toss the wings until they are evenly coated. Step 10: Enjoy with your favorite brew, a side of celery, carrots and ranch dipping sauce (or bleu cheese if you prefer). The crunch is undeniable in this one. It’s heaven if you like honey. MMMM I wish I could just convey how this makes my heart melt. You can substitute the honey pepper sauce with any kind you prefer: Barbecue, Parmesan-garlic, Teriyaki, Lemon-Pepper, Sesame-Ginger, the delicious mouth-watering options are endless. You’ll make new friends. 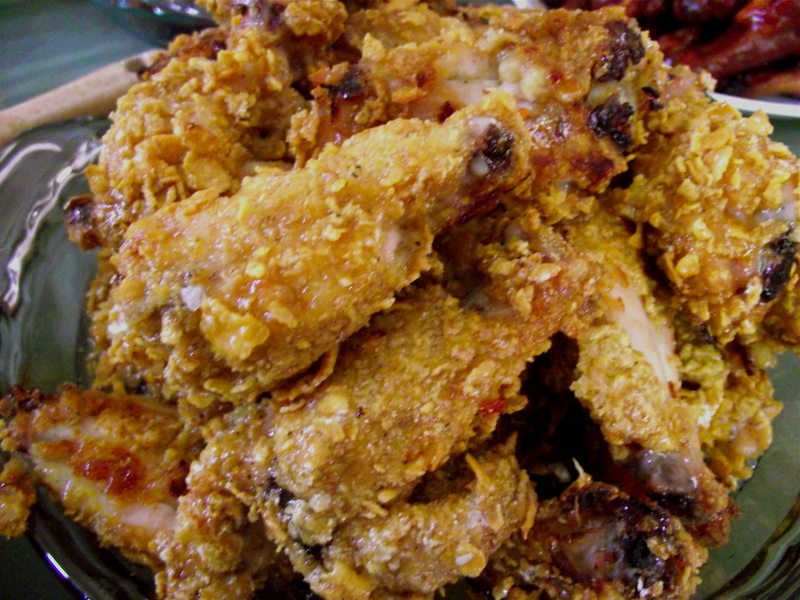 Keep in mind however, that making these chicken wings can be a double edged sword. While you yearn for the crisp of the cornflakes, you also want the flavor from the sauce. For best results, serve immediately. A few hours after making these, the breading from the leftovers became soft as a result of absorbing the sauce – a natural casualty of course. If you plan to bring these to a party, keep the chicken and sauce separate until you arrive. Keep the chicken well vented and don’t pre-mix. Same thing goes if you’re waiting for guests. Mix the wings with the sauce right before serving. Thank you Jer ! It’s one of my faves!